Runner up Dany Normandin, Tour Director Danny Hewitt, winner Francis Crevier. 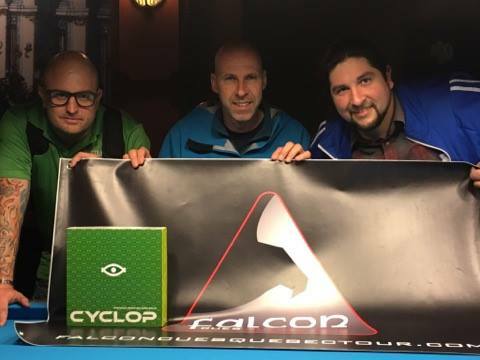 On the weekend of April 29-30 Dooly's Valleyfield hosted the Grand Final of the Falcon Cues Quebec Pro Tour. This marks the conclusion of the second year of this tour under the direction of Alain Parent, Danny Hewitt and Luc Paquette. The tour featured 13 regular season stops which were spread out over three provinces. Some tournaments were as far away as 12 hours from their home base of Montreal but these organizers despite having full time jobs, families and one with health issues made it to all the tournaments themselves and promoted pool. Before the formation of this tour there was virtually nothing for elite players to participate in Quebec, and Eastern Ontario. I would like to congratulate them on their success and thank these three for their tireless work and filling this much needed void in our pool community. 57 players descended upon Dooly's Valleyfield to participate in this Grand Final. This room is easily one of the nicest in the area and was made even better by having all their tables changed to Simonis Tournament Blue cloth days before this event. The format in this circuit is races to 9 on both the winners and losers side, alternate break 9 ball call shot and break from the "box." All the top players from the talent rich province of Québec were in attendance such as Francis Crevier, Alain Martel, Danny Hewitt, Sylvain Grenier to name a few. Ontario was represented by Andy Aupin, Jared Amyot and Jean Theriault. The Average Falcon Tour stop has seen around 32 to players which has been good but at times the top 5 positions have been a bit predictable and upsets far and few in between. With the extra players who came to participate for this $4000 added event it set up the potential of some upsets which did occur. The biggest one to mention would be Danny Hewitt who over the past two years has won well over 50% of these events, did not make it to the second day. He was eliminated by two strong semi-pro's Yves Gaudreault and Sebastien Cousineau. The other upset to the disappointment of the local fans was Luc Salvas not being able to make it to the second day losing to Eric Cloutier and Sylvain Grenier finishing in the 9th-12th position. The top 8 players were brought back on Sunday to see who would be crowned Grand Final Champion. On the winners side it was Andre Pelletier vs Francis Crevier and Dany Normandin vs Norm Pomanville. The first losers side matches of the day included Jean Theriault vs Yves Gaudreault and Alain Martel vs Slyvain Grenier. Crevier won a close match 9-7 against Pelletier and Normandin eased passed Pomanville 9-4. Grenier eliminated Martel and Gaudreault did the same to Theriault. The next round of matches pitted Crevier vs Normandin in the winners side final which Normandin won 9-2. Back on the losers side Grenier faced off against Pelletier in what could be considered the most entertaining match of the tournament. Pelletier is a pro who played his most pool in the 1990's and saw a fair degree of success. As of late he has had a resurgence and showed his strong mental in this match. Grenier started off on fire and quickly gained a 6-0 lead which in alternate break usually in all fairness means the match is done. However before you can blink it was 7-7. When the score was 8-8 Grenier did what champions tend to do, he seized the moment broke a perfect rack and carefully ran out for the win. Grenier's run on the losers side would end in the 4th place match as Gaudreault continued his impressive performance wining 9-8. Crevier was waiting for him in the losers side final and made quick work of Gaudreault 9-2. He carried this momentum into the final winning the extended race to 11-3. Congratulations to Crevier for adding another big win to his resume. The Falcon Tour does have one more stop at Dooly's Levis May 13-14 for the top 16 in points during the regular season. This is a $1500 added event. I would like to thank Parent, Hewitt and Paquette for giving me everything necessary to cover this tournament and for being one of Cue Sport Nations sponsors. I look forward to covering next season of the Falcon Tour.